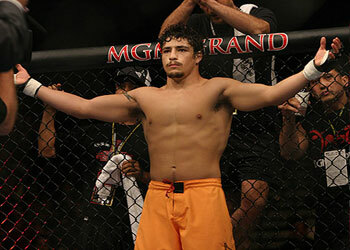 UFC 95 will officially mark the third weight class that Diego Sanchez has fought in for the organization. He began his tenure as the middleweight winner on the inaugural season of “The Ultimate Fighter,” and then dropped to the welterweight division where he achieved a 7-2 record, however found out that he was physically over-matched against the division’s larger fighters. Joe Stevenson now welcomes him to the 155-pound division. “I’ve never felt better in my life,” Sanchez said about his new weight. With the drop, he hopes to be able to impose his larger stature on the smaller lightweights. Although the weight cutting hasn’t been easy, at this point in his career, he feels that it is necessary. The UFC’s welterweight and lightweight divisions are two of their deepest weight classes, so Sanchez knows that there won’t be a quick road to the title either way. However, he intends to test the waters at 155, with a move back up to 170 sometime in the future. “I definitely am going to go back to welterweight. Maybe a year, year and a half at this weight, we’ll see,” stated Sanchez. “It’s all about the business and the right fights, whatever are the best fights for the UFC. I’m here to put the best fights on for the fans and the UFC, and be the best fighter out there that I can be for you guys.